Canada is home to a small variety of freshwater (land-based) and marine turtles, which are part of the reptilian family of the animal kingdom. 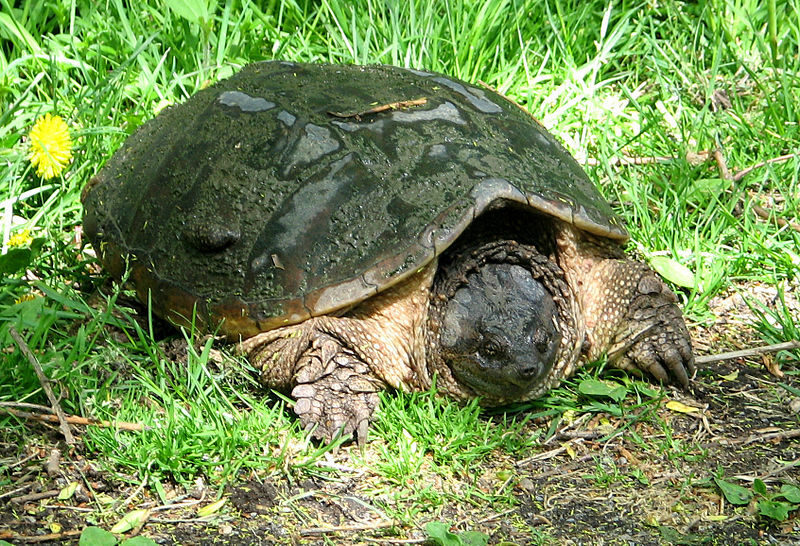 Although the majority of Canada’s freshwater turtles inhabit Southern Ontario turtles can be found along the southern borders of most of Canada’s provinces. In contrast, among the marine turtles that visit Canada’s shores none nest here. According to the Committee on the Status of Endangered Wildlife in Canada (COSEWIC) , a group of experts that assess the status of species in Canada, a number of Canada’s turtles are endangered or threatened. The most dangerous threat to turtles is humans. The biggest threat to turtles is man, either through poaching or through encroachment into habitats by roads. Female turtles prefer to lay their eggs in mud, sand, or dirt areas; thus often can be found along roadsides or ditches from May to July where these conditions are easy to find. In the spring and fall land-based turtles can travel up to several hundred meters to reach nesting grounds. Different species of turtles can be active during different times of the day, but most often you will see them in the morning and late afternoon. The leatherback turtle (one of Canada’s marine turtles) is the largest reptile in the world reaching up to 2.5 m in length and 550 kg in weight. Because turtles have a very long maturation period, several years up to 20 years, many do not live long enough to reproduce. Turtles can live between 20 to over 75 years long. Many turtles have soft shells and many turtles cannot retract inside their shells. Both land-based and marine turtles are vulnerable to a number of natural and human threats, with many of the world’s turtles on various endangered species’ lists. As adults, land-based animals can be preyed upon by animals such as large cats, foxes, minks, raccoons, and coyotes. Similarly, adult marine turtles can be preyed upon by sharks, octopi, or other large marine animals. However, the hard and large shell of adult turtles offers substantial protection as it is difficult for predators to penetrate, thus most adult turtles have few natural predators. Furthermore, many freshwater turtles are able to retract their head and limbs into their shell, or fold their head to the side under their shell for added protection. In contrast, turtles are most at danger during their incubation period inside the egg or as a hatchling. Larger prey will often eat the eggs or catch the hatchlings as they make their way to the water. The largest threat to turtles, however, is humans. Turtles are often poached for their meat or for their eggs, the latter a delicacy in many Asian regions. Turtles are also increasingly threatened by human activity and intrusion into turtle habitats. 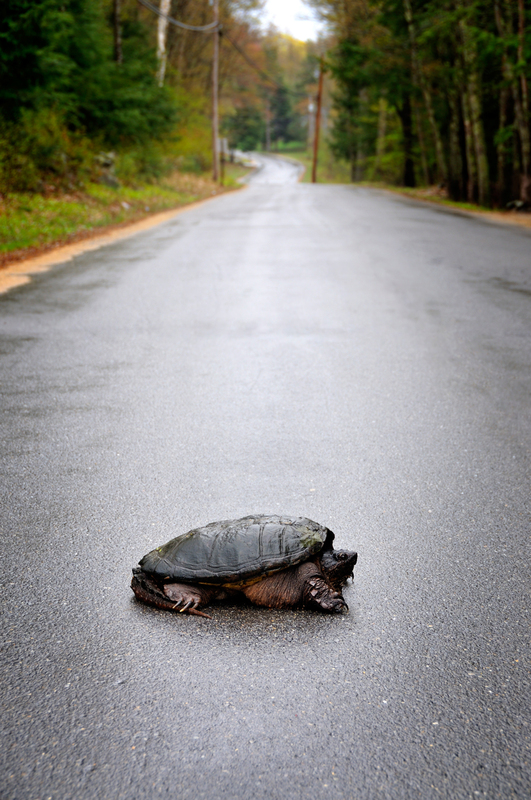 Roads in particular represent a serious threat to land-based turtles. In Canada, turtles will often traverse roads to move to and from nesting areas, usually during the months of May and October. Additionally, female turtles often prefer the dirt, gravel, or sandy areas next to roads as a place to make their nests and lay their eggs. Both freshwater and marine turtles are threatened by human activities in the water such as becoming entangled in or injured from fishing gear or by pollution floating in the oceans such as discarded garbage. produce males and warmer temperatures generally produce females. Turtles range in colour but typically have variations of dark green, olive, or brown shells. Their shells and their body are often marked with lines or patches of brighter colours such as yellow, orange, and red. The plastron is typically lighter in colour and often has markings or colour patterns that can aid in distinguishing different species of turtles. Most land-based turtles, particularly those that enjoy basking in the sun are active during daylight hours, typically moving around during the early morning and late afternoon. In contrast, many turtles that spend the majority of their time in water or are susceptible to dehydration, such as the stinkpot turtle, are nocturnal and can be found moving during the late evening when temperature have cooled. As such people may come across turtles at any time day or night. Since marine turtles spend almost their entire lives in water, they have adapted to resting periodically throughout the day while floating at the water’s surface. All turtles produce offspring by laying eggs, including female marine turtles which return to beaches to lay their eggs. Eggs typically incubate between 45 and 90 days before baby turtles (hatchlings) break out of the shell and then often spend several more days crawling out of their nest. Different turtles nest at different times, but the range in Canada is usually between the months of May to July. Female turtles usually bury their eggs in mud, sand, or dirt by hollowing out an area, laying the eggs, and then covering the eggs with the unearthed ground. For this reason, it is not uncommon to see female freshwater turtles searching for good nesting spots alongside roads and in ditches, where there is often more dirt than vegetation. Different species of turtles lay different numbers of eggs, ranging from a few eggs to a couple hundred. However, the survival rate of eggs and hatchlings is very low, between 1 in 100 to 1 in 1000 for some turtle species. Furthermore, many turtles only lay eggs every two to three years. Once hatched, most turtles require many years to reach maturity before they are able to breed. This can be anywhere from several years to over 20 years before becoming an adult. During the winter, some freshwater turtles hibernate underwater often in the mud underneath while others choose other water source areas, such as fens. During the summer, many of these turtles, particularly those which primarily live in the water can remain underwater for several days at a time. Turtles are exothermic meaning that they are not able to generate their own body heat and must rely on the environment to regulate their temperature. For this reason, turtles typically live in warmer climates. Turtles in Canada have been able to adapt and many turtles can be found ‘basking’ in the sun. The exception is turtles which dehydrate quickly, such as the stinkpot turtle which remains under water for the majority of its time. Whether a land-based or a marine turtle, all turtles breathe air and cannot survive indefinitely underwater. Once hatched, male marine turtles almost never return to land and spend their lives living in the ocean. Females return to land, usually sandy beaches, only to nest and lay eggs. Marine turtles often migrate between warmer (nesting) climates, such as the Caribbean and cooler (foraging) climates, such as Canada; however, it can be difficult to track their actual migratory paths between these destination points. There are approximately 300 species of turtles worldwide, thus turtles can vary greatly in appearance and size. Generally, however, they are easily recognizable by their typically hard upper shell of horn-like scales, or carapace, and their lower shell, the plastron, which can range in size. These two shells cover the majority of the turtle’s body, excluding its limbs, tail, and head, which extend from the shell. A turtle’s shell is part of their body that extends from the turtle’s ribs and joined to their backbone thus it cannot be removed. Not all turtles have hard shells. Some turtles, such as the leatherback turtle which visits Canada’s Atlantic and Pacific coastlines or the spiny softshell turtle found in southern Ontario and Quebec, have leathery skin for a carapace instead of the hard scales found on most turtles. Land-based turtles in Canada range in size between 8 and 25 cm and marine turtles may be as large as 2.5 m, which includes the largest turtle, the leatherback. Adult turtles range in weight from a couple hundred grams up to 1.5 kg, while marine turtles such as the leatherback reach average weights of up to 550 kg. A turtle’s short limbs and rather rigid body force them to move slowly on land; however, many turtles can be quite active in water and swim rather quickly. In safer environments, turtles generally have long life spans, living anywhere from 20 to over 75 years old. However, it has been difficult for researchers to study the life span of numerous species of turtles and therefore many ages are approximate. All turtles are omnivores, that is, they eat both meat and vegetation. 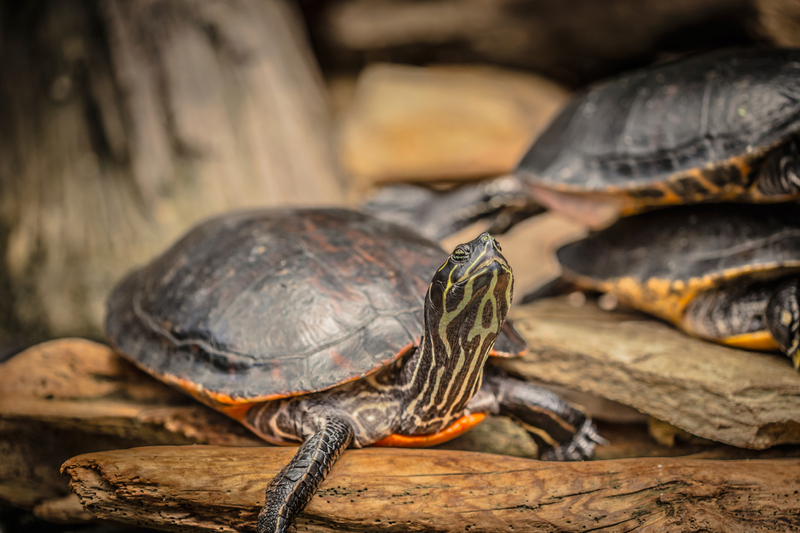 Due to their inability to move quickly freshwater turtles in Canada usually feed on dead animals such as fish, worms, snails, insects, frogs, and minnows but will also eat plants, particularly aquatic vegetation. The diet of marine turtles depends on the species. For instance, leatherbacks typically eat jellyfish, while the loggerhead turtle, a turtle found along Canada’s Atlantic coastline, will eat a wide number of ocean dwellers such as smaller vertebrates, sponges, anemones, coral, star fish, sea cucumbers as well as vegetation such as algae or other marine plants. Turtles do not have teeth but instead use their hard ‘beaks’ and bony jaws to trap and, for some turtles that have very sharp jaws, to chew food. Due to the inability to chew food, other turtles such as painted or leatherback turtles must eat their food in the water where they can use the water to help grasp and swallow their food. To learn more about some of Canada’s specific turtle species, clink on the link below or go to our Downloadable Resources page to download these and other resources. Nova Scotia’s Blanding’s Turtles: Conservation and Recovery.